J.Godwin - On Your Marks! 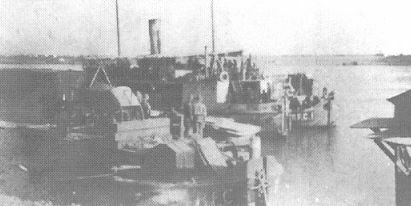 The supporting barges for 30 Squadron in Mesopotamia. Note the Henry Farman (Voisin ???) fuselage on the nearest vessel. This picture was captioned "The rest of the Squadron arrives from Sheil Saan an ‘Arab Village’ Oct 1916”. Lts Page and Rattray beside their BE.2c after the collision with a German machine on April 3, 1917. 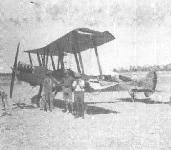 Note the wingtip is missing. Lt Merton’s Shorthorn (???). Unfortunately, the picture is badly faded.